A mob of alleged Bangladeshis attacked a residential society in Noida in July 2017. The mob got furious when a domestic help Zohra Bibi working in one of the flats in the society went missing for a few hours. Later on, the police found out that Zohra Bibi had stolen money from her employers’ house and her act was caught on CCTV camera. When the employers confronted her and threatened to report the matter to the authorities, she panicked and went into hiding in the society. On not finding her, Zohra Bibi’s husband Abdul Sattar and their friends attacked the society and the employers. They pelted stones and used rods to break door and window panes. The employers miraculously escaped by locking themselves up in their bathroom. They could be rescued only after the police reached the spot. Subsequently, the residents decided not to employ the Bangladeshis. In a joint operation conducted by the Uttar Pradesh Anti-Terror Squad, Noida Police and West Bengal Police, two Bangladeshis were arrested from the Surajpur police station area of Gautam Budh Nagar district on July 24. They were suspected of being active members of Jamaat-ul-Mujahideen in Bangladesh. The two suspects – Rubel Ahmed alias Munir-ul-Islam and Musharraf Hussain alias Musa – were operating out of Noida and Ghaziabad after fleeing from their country in March. Such incidents of crimes involving the Bangladeshis have been reported from other parts of the country as well in the past. No wonder even the courts have emphasised the need to identify the illegal immigrants and deport them. The Delhi High Court ordered the deportation of a Bangladeshi family back to their country in 2008 on the ground that illegal immigrants pose a danger to India’s internal security. Justice SL Bhayana dismissed Razia Begum's petition against her deportation. Razia Begum and four members of her family were arrested from Khanpur area of South Delhi on December 28, 2007, by the deportation cell of the Foreigners Regional Registration Office's (FRRO). Razia Begum approached the court against the FRRO’s decision to deport her and members of her family. However, the Delhi High Court upheld the FRRO’s decision to deport the family back to Bangladesh, observing that if someone is able to obtain a passport, ration card, election identification card and nationality certificate by illegal means, it did not mean that one is an Indian national, until and unless one gets his nationality through legal means. This is where the National Register of Citizens (NRC) holds significance. Though it has been implemented specifically in Assam to identify illegal immigrants, particularly from bordering Bangladesh, the register needs to be prepared for other states which are afflicted with the same problem. 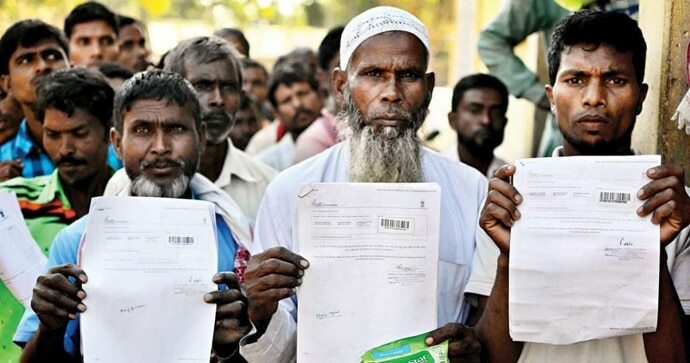 The NRC for Assam published the second and final draft of the bona fide residents and illegal immigrants. It omitted 40 lakh people from the draft. The NRC has got politicised with Mamata Banerjee-led TMC and the Congress opposing the NRC’s decision while the government defending it. But the issue of illegal immigrants is a grave one and is not limited to Assam alone. Union home ministers have made statements from time to time in Parliament over the number of illegal Bangladeshi immigrants in India. However, there is no concrete data as such. All the figures have been based on intelligence inputs and internal reports. Secondly, Assam accounts for just a fraction of the total number of illegal Bangladeshi immigrants in India. West Bengal is estimated to have about 55 lakh such people, 15 lakhs more than their number in Assam. If Assam can have an NRC, it is urgently warranted in West Bengal. Moreover, the problem of illegal Bangladeshi immigrants afflicts not just Assam or West Bengal but other states as well. To ascertain the exact figure – just as in Assam – the NRC exercise needs to be carried out throughout the country. So far, the Union ministers have only given a rough estimate from different points in time. For instance, replying to a question in Rajya Sabha on November 16, 2016, Union Minister of State for Home Kiren Rijiju said there were 2 crore illegal Bangladeshi immigrants in India. “There are reports of Bangladeshi nationals having entered the country without valid travel documents. Since entry of such Bangladeshi nationals into the country is clandestine and surreptitious, it is not possible to have accurate data of such Bangladeshi nationals living in the various parts of the country. As per available inputs, there are around 20 million (2 crore) illegal Bangladeshi migrants staying in India,” Kiren Rijiju said in written reply to a question asked by Rajya Sabha CPM MP from Tripura, Jharna Das Baidya. In the Rajya Sabha itself on July 15, 2004, the then minister of state for home Sriprakash Jaiswal had put the number of illegal immigrants in 17 states and Union territories as on December 31, 2001, at 1,20, 53,950. The increase of illegal Bangladeshi immigrants was a whopping 80 lakh people in 15 years throughout India. Jaiswal had said Assam alone accounted for 50 lakh illegal Bangladeshi immigrants while West Bengal had the dubious distinction of having the highest number at 57 lakh. However, under political pressure, Jaiswal withdrew his report later saying it was based on “unreliable reports” and “hearsay”. But other reports seem to have vindicated the replies of Sriprakash Jaiswal and Kiren Rijiju. In the first few decades after Independence, Assam, Tripura and West Bengal received the majority of the illegal migrants from what was then East Pakistan and present Bangladesh. Subsequently, the other north-eastern states except Manipur too were flooded with these immigrants, recording high rate of population growth, much higher than the national average. Slowly and gradually, the Bangladeshi immigrants spread to other states such as Bihar, Uttar Pradesh, Odisha, Gujarat, Karnataka, Tamil Nadu and Kerala. On May 6, 1997, the then home minister Inderjit Gupta stated in Parliament that one crore illegal migrants from Bangladesh were residing in India. Around the same time, quoting the ministry of home affairs and Intelligence Bureau sources, media reports stated that there were approximately 1,08,30,000 illegal Bangladeshi immigrants in India. The illegal Bangladeshi immigrants pose different problems for the country. Besides being a security risk they influence the polity and eat into the already constrained resources of a developing India. The sooner a nationwide NRC is prepared the better for India.